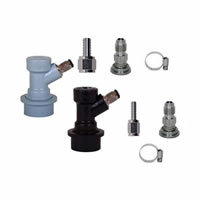 This commerical to homebrew conversion kit includes two 1/4" MFL tailpieces, a liquid and gas MFL disconnect, a 5/16" and 1/4" barbed swivel nut set (for connecting lines to Converted Sanke and disconnects on gas and beer lines) and two stainless adjustable worm clamps. To use this kit take beer and gas line off of your existing Sanke tap. Remove the tailpieces you removed line from and replace with the 1/4" MFL tailpieces in kit. 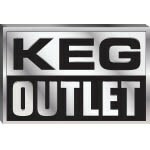 Put 5/16" Swivel nut on your gas line and 1/4" on your beer line. Then tighten down with worm clamps. You will now be able to go between the Sanke tap and homebrew disconnects by unscrewing swivel nuts and screwing back on the connection you need.